This year, marks the forth consecutive celebration where Detroit area musicians and entertainers perform to express in song their appreciation for law enforcement serving to protect within our communities. Performing for Detroit's Finest were "Kern Brantley" former Music Director for Lady Gaga, Leslie Nelson-Ferguson, President, DMAMEA, Priscilla Price and Janice Simon Vocalists. Description: During National Police Week, as an effort to celebrate law enforcement, for the fourth year consecutively, a Jazz Luncheon was held to promote wellness on Wednesday, May 17, 2017. 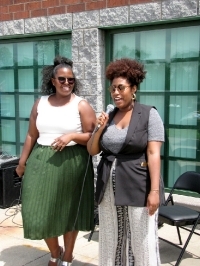 The event was held at the 11thPrecinct sponsored by Detroit Police Department - Community Relations Section in collaboration with Detroit Entertainers & Musicians News who powered the entertainment.